The City Council approved a plan to demolish the graffiti space in favor of luxury buildings, but 5 Pointz is fighting back with a lawsuit. The future of Long Island City arts hub 5 Pointz has long been uncertain: Although the space—which has served as a sort of legal outlet for graffiti artists for more than a decade—is popular with both locals and tourists, plans to turn the complex into high-rise condos have been rumored for several years. And this week, those rumors seemed to become official: New York's City Council approved plans to demolish 5 Pointz and erect two luxury condos in its place. 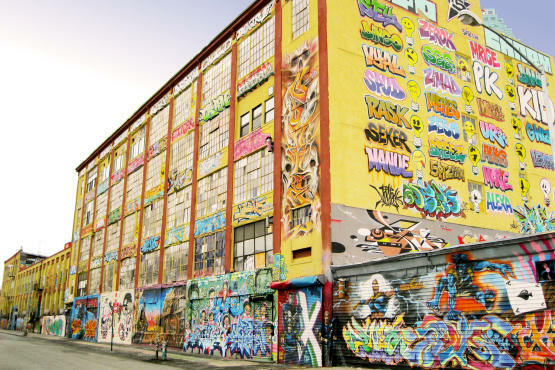 The plans, which represent an agreement among city officials, developers and the Wolkoff family (the current owners of the warehouses in which 5 Pointz is located), call for housing, parkland, 12,000 square feet of art space inside the building, and exterior areas where aerosol artists could display their work. We spoke with Flageul earlier today about the City Council's decision; she was adamant that 5 Pointz hadn't given up yet. "As far as we're concerned, [the construction] plans aren't coming to pass," she says. "We have artists painting here today. Our priority has been to do what we do, and do it well." She raised several concerns about the new agreement, including the impact that such a large-scale construction project would have on Long Island City. "Jackson Avenue will be a dead zone—it'll be a nightmare," says Flageul, noting that work on the 7 train has already made it more difficult for people to visit the area. "I think it will kill Long Island City as a destination." She also dismissed the idea that Meres One or any of the other artists who've regularly contributed to 5 Pointz would return should high-rises go up in its place. "For a developer, having curated walls on the property is a good marketing tool," she notes. "But 5 Pointz is by the people, for the people. If we're talking about artists being part [of the development plans], any artist in their right mind wouldn't come back for free. I don't think Meres would come back and do this."